It's been a dreadfully dreary couple days. The thick morning fog off the water seems to stay in my brain well past noon. I am one big shiver and finding it very hard to be motivated outside of my work day. Too many gloomy days in a row and I go into hibernation mode all over again. I'd contemplated crawling under the covers early after a long day of teaching, and then I remembered the poppies! 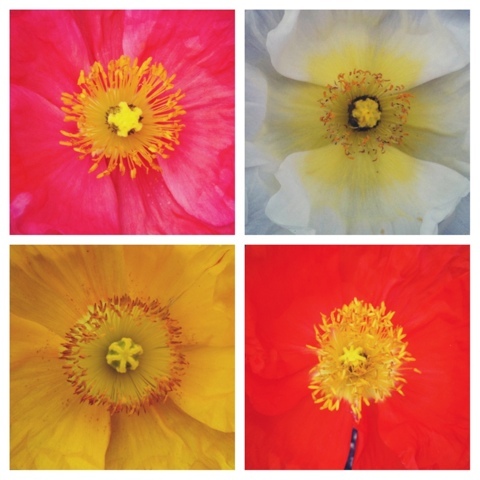 I took these pictures on a walk through a poppy garden the other day, which is a testament to our typically mild winters here in San Diego, and proof that I'm a big whiny baby because it's truly not that cold here compared to many places. What can I say? I like sunshine, balmy weather and reasons to eat ice cream. I also love me some flowers! I found these while browsing through my camera roll and they made me smile. I figure it's kind of like light therapy for people who suffer from seasonal affective disorder. I stared at these warm, happy flowers all through dinner and I'm feeling better. Maybe not energized enough to take on that painting project or to clean my house, but a book and a pup on my lap sounds nice. That's important too. I'm not ready to give up on this day just yet. I think fighting the winter blues has a lot to do with being nice to ourselves and finding the little things that brighten dreary days. I'm going to keep this photo handy for a dose of color therapy whenever the sky is gray. In fact, I've started a new album in my camera roll specifically for cheerfully colored photos. Many artists collect color schemes to use in future projects, and now, so do I. Sometimes inspiration comes unexpectedly. Thanks, Winter. I owe ya one.